Intel is undisputed King in the processor market. The Xeon solutions have in fact established for many years as the preferred solution by leading global provider, by AWS to Google. To Fight With Proprietary Hardwares, the IEEE Industry Standards & Technology Organization Announced OpenCAPI Consortium asFederation Program Member For Future Cloud Server Hardware. This will benefit high performance computing, cloud data storage, security, machine learning and analytics by allowing for high performance accelerators that can support the higher speed of most recent technologies. 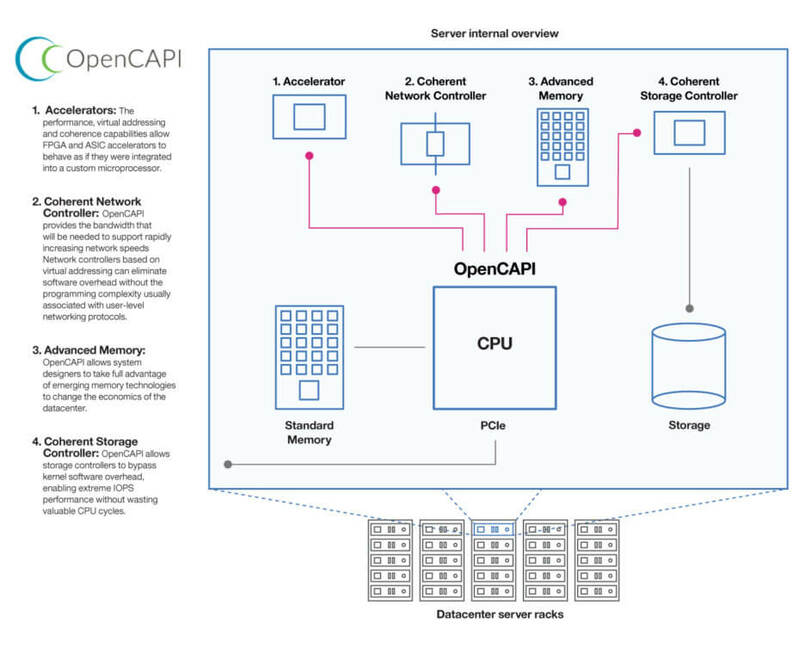 OpenCAPI Consortium, a consortium led by IBM and other leading technology industry companies including Google, AMD, Nvidia, HP, DELL and others are trying to reverse the trend of the market by presenting a set of technical specifications which is “open” for the cloud servers and data centers. According to them, OpenCapi (which is also the name of the proposed alternative and is about to Open Coherent Accelerator Processor Interface) will be able to significantly increase machine performance – up to ten times compared to current standards. The idea behind the project is to combine the classical processors, whose race has slowed considerably in recent years, additional hardware can increase the total computational power : these components are already on the market and/or are on the way – Nvidia GPU, AMD or reprogrammable chip, dedicated ASIC and FGPA from Microsoft and Intel. But with a body they will be able to communicate more effectively than at present. The future of computing model sees the combination of a processor designed for data management, as said by general manager of IBM Power Systems. OpenCAPI pointing the attention of organizations and companies that find themselves managing data intensive workloads. Interest in services related to the data analysis and machine learning/deep learning is high: the major cloud providers have started to move in this direction (like Google with Tensorflow, AWS with machine learning service, IBM Watson etc) and approaching the time when we will establish the balance of power between hardware suppliers and buyers. The companies belonging to the consortium hope to expand the range of solutions available and to create a viable alternative to Intel avoiding any repetition of the x86 server market – where Intel can handle with ease the price lists of chip. The first server components and adopting the OpenCAPI interface will come in the second half of 2017. IBM will start a solution based on POWER9 processors and then leave the field open to other members of the consortium and to OpenCAPI – especially interesting could also prove Zaius, a server developed by the partnership between Google and Rackspace. They will complete the road map between 2017 and 2018 and other FPGA solutions for networking. This Article Has Been Shared 9276 Times! Cite this article as: Abhishek Ghosh, "OpenCAPI Specification For Future Cloud Server Hardware," in The Customize Windows, November 18, 2016, April 26, 2019, https://thecustomizewindows.com/2016/11/opencapi-specification-future-cloud-server-hardware/.